m a y f i l e s . . .: A Real "Labor Day"
This city mouse visited her country mice mother and sister on their farm and ranch respectively. This is how they put us to work. Well actually, I didn't work, I just followed around on my mom's bike with the camera. It all began in my sister's hay field. 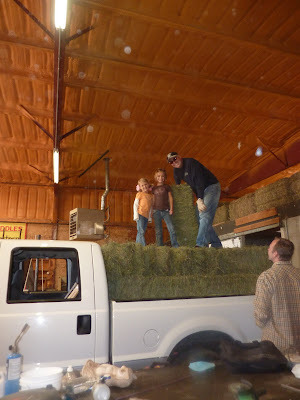 It was followed by a dramatic ride atop the bales in Grandpa's pickup truck. Clearly this was a messy job. And the finale was certainly the hay elevator. Notice the country mice children versus my city mice. Tah dah! The hay loft with fresh new hay for grandpa's animals.